The Great Golf Duel: Tiger Woods or Phil Mickelson? 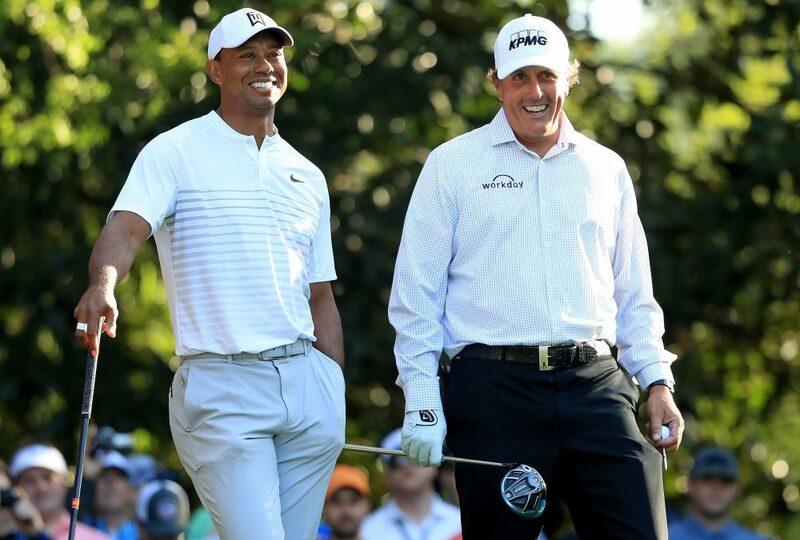 In one of the biggest golf tournaments this year, at Augusta National, Phil Mickelson suggested to Tiger Wood that they train together, which was a great surprise for the golf world; two giants and enemies for decades, training together and apparently happy to be training around each other. In one of the interviews on television, when asked about the friendship that had blossomed between Tiger and Phil, Phil showed how good a person he is and how much character he has when he answered the interviewers with the following: they were not so close in the past, which was good for both of them, everybody needs a person to follow and Tiger Woods was who motivated Phil to always keep searching for better results. Today, times have changed and they learned together and they are in another stage of life. This enmity of the past is a thing of the past. But, what most caught the attention of the media is a match between Phil and Tiger and the winner of that challenge takes home $10 million. So, how did this whole challenge get started? Well, while in an interview during the Player, Phil said: “I don’t know if he wants a piece of me but it would be something fun for us to jump to the final round.” Tiger responded by simply saying, “Big picture”. By this, Tiger meant that, if you looked at the big picture, he has more wins and major championships than Phil. So, since we are in this tense atmosphere in doubt of who will be the winner, let’s take a ride in the past and remember important moments in the history of these golf giants. Mickelson was born in San Diego, California in 1970. Phil began his career in golf early in the state of Arizona where, before the age of 22, he won 3 individual championships. Phil started to play competitive golf when he was still a teenager. At that time, he won over 30 San Diego Junior Golf Association titles. Coming from a simple family, he took advantage of his father who was pilot of an airline company, which allowed him to save money on airline tickets to attend tournaments. His mother had two jobs to help him with the expenses in the American Junior Golf Association play. This just shows how much his family believed and trusted in Phil’s talents. In the year 1990, Mickelson was the only left-hander to come away with a giant “W” with the U.S. Amateur title and he also won for his first PGA tournament, which placed him 4th in history. Famed for being left-handed, Phil boosted his career when he won the Masters in 2004. Phil has always been the type of golfer to take risky shots. One evidence of this was in 2010 at the Masters when he decided to go for the 13th green from the pine straw rather than laying up. As a professional golfer, his first win was in 1993 at the Buick Invitational of California. He did not stop there as he also won the Mercedes Championships in 1994, the GTE Byron Nelson Golf Classic in 1996, Arnold Palmer’s Bay Hill Invitational in 1997, AT&T Pebble Beach National Pro-Am in 1998, The Tour Championship in 2000, Canon Greater Hartford Open in 2001, and the Bob Hope Chrysler Classic in 2002. Although Phil was a great golfer with a total of 21 victories, he still had not won one of the biggest golf tournaments, in other words, he was one of the best golfers ever who never won a major. The big day came at 33 years old in 2004 in one of the biggest tournaments in the history of golf, the Master’s Tournament, at Augusta National, located in Augusta, Georgia. With birdies and eagles happening constantly on the back nine, Phil finished his eighteenth hole with gold keys, with a marvelous birdie 18-feet away, making it clear to the world who was winning the Masters in 2004. To date, Phil Mickelson has more than 47 professional victories. among them, 43 on the PGA Tour. Besides being a strong professional and one of the best golfers in the world, he is also an incredible human being. I had the pleasure to meet him and follow him during 18 holes at the Houston Open this year. I can say, with confidence, that it was one of the best experiences in my entire life. At each hole, Phil stopped by, asked how I was, where I am from, thanked me for being there. My husband and I became a fan of him and one of the most striking moments for me was when, at the end of the round when golfers go to sign the scorecard, I was on the outside (obviously) waiting to get an autograph. When he passed by. the people and saw me, he stopped and warned me that he would come back to give me an autograph. Tiger Woods was born in Cypress, California, in 1975. This prodigy boy set his first record at the age of 21 when he was the winner of one of the world’s biggest golf tournaments, the Masters Tournament. Tiger was the youngest, and first African American, to win the Masters tournament. After that victory, Tiger won over 10 majors and was named Best Golfer of the Year, 10 times, in a period of 12 years! With a total of 109 professional victories throughout the high and low moments of his career, Woods possesses a lot of victories. Tiger’s total wins put him at second place with 79 wins on the PGA Tour with only three victories short of Sam Snead, who won over 82 PGA events. Another record of Woods, and yet another in which he is in second place, is the highest number of win in Major tournaments. Tiger holds second place with a total of 14 majors. Do you know who holds the first place spot? It’s Jack Nicklaus with 18 major wins! Tiger is back on the golf course, raising many expectations, both in the golfing community and among his thousands of fans. What we have left now is to wait and see what lies ahead, something tells me that this Tiger full of determination will still surprise us in the very near future. 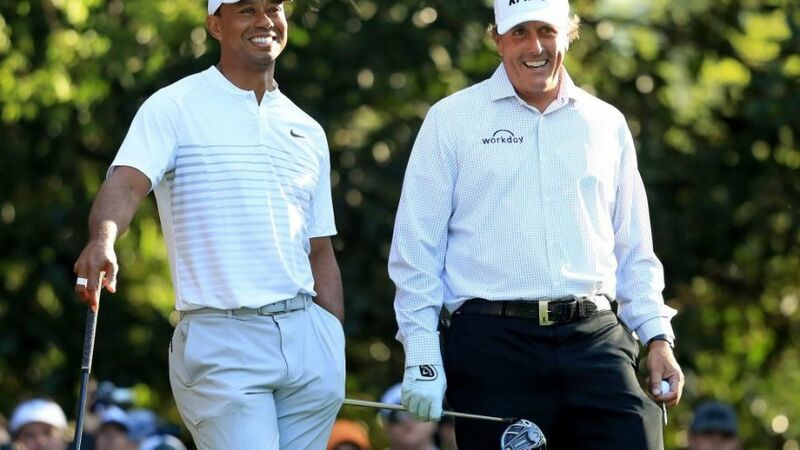 At the end of the day, the match with Tiger versus Phil is going to be loads of golf fun. The editors should spin it as a new way to golf, full of introduction music and hijinks. As far as who will win the match, it will be totally dependent on who is hot that day.